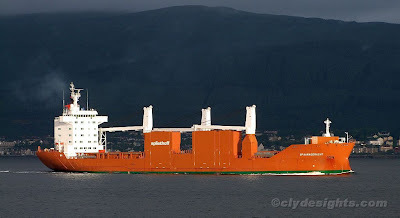 Early morning sunlight catches the Dutch cargo ship SPAARNEGRACHT as she steams past McInroy's Point towards Greenock, where she would berth at Ocean Terminal to load paper reels for shipment to the USA. The Spliethoff-owned ship, no stranger to the Clyde having been here on a number of previous occasions, sailed on Wednesday afternoon for Baltimore. I love this picture ... the bright orange against the very dark background ... brilliant. I missed this one coming up ... doh!! Well done you. Yes, it is a fantastic picture.